We are proud of our facility and our childcare playroom. It is our mission to provide quality childcare in a safe, sanitary, and welcoming environment while you enjoy the full benefits of our workout facility. 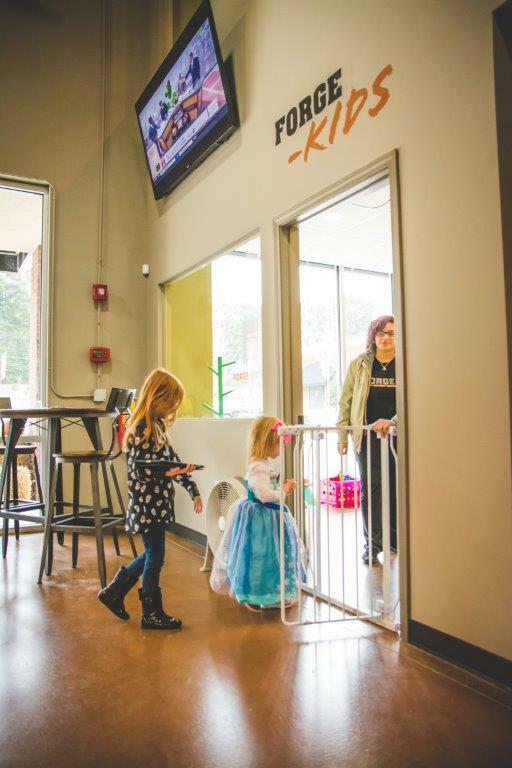 Our relaxed and fun atmosphere in Forge Kids will keep your child safe and entertained so that you can focus your time without the worry. Children ages 6 weeks to 13 years are welcome in our childcare. Members must complete an information/waiver card on EACH child for our records. Members can only bring the children they have registered in our system. There is a two hour maximum. Please plan your workouts accordingly. The playroom is available during the posted hours of operation. You are required to sign your child in and out each time you visit. If someone other than the person dropping the child off will be picking up the child, the caregiver must be notified. I.D. is required. You must remain in the gym while your child is in our childcare. Forge Kids employees are not allowed to change diapers or feed children. If needed they will notify you. Snacks and drinks are not allowed in the Forge Kids room. There is a snack bar just outside the room if they need to use it prior to coming in. We provide a variety of safe and age appropriate toys. Please refrain from bringing toys from home. We will not be held responsible for lost or stolen toys. We will keep lost and found items a total of 30 days. If not claimed in 30 days they will be given to Goodwill. These rules are not limited to the above stated and are subject to change as we deem necessary.